This page lists a core of Prof Joe Cain’s recent publications. It is not exhaustive, but concentrates on key research areas. Search UCL research publications database for Cain (Web). Cain, Joe. (forthcoming-accepted). In My Tribe: What Snouters (and Other Jokes) Reveal About Tribes in Science. Endeavour. Cain, Joe (ed.). 2018. Night Thoughts: George Gaylord Simpson’s Reflections on Leaving the American Museum of Natural History (London: UCL Department of Science and Technology Studies), STS Occasional Papers number 7. Cain, Joe. 2013. Synthesis Period in Evolutionary Studies. In Ruse, Michael (ed.). 2013. Cambridge Encyclopedia of Darwin and Evolutionary Thought, The. Cambridge: Cambridge University Press, pp. 282-292. Abstract: While Secretary of the Zoological Society of London (1935–42), Julian Huxley used that institution to undertake several types of reform related to his promotion of ‘general biology’. Huxley’s goal was to place synthetic, analytical and explanatory work at the centre of the life sciences. Here, zoological specifics served only as instances of generic processes. Huxley’s campaigning fitted both into his own lifelong obsession with synoptic views and into much larger transformations in the epistemic culture of the life sciences during the interwar years. However, such campaigns also had their detractors, and the Zoological Society of London provides a superb example of the backlash provoked against these reforms. In 1942 that backlash led directly to Huxley’s dismissal as Secretary of that society. This episode serves as a reminder to understand the plurality of views in play during any historical period. In this case, general biology was resisted in a factional dispute over what should be the priority of the life sciences: objects versus processes, induction versus explanation, and particulars versus generics. Cain, Joe. 2009. Rethinking the Synthesis Period in Evolutionary Studies. Journal of the History of Biology 42: 621-648. DOI: 10.1007/s10739-009-9206-z. This paper received “special commendation” by judges for the BSHS 2010 Slade Prize. Abstract: I propose we abandon the unit concept of “the evolutionary synthesis”. There was much more to evolutionary studies in the 1920s and 1930s than is suggested in our commonplace narratives of this object in history. Instead, four organising threads capture much of evolutionary studies at this time. First, the nature of species and the process of speciation were dominating, unifying subjects. Second, research into these subjects developed along four main lines, or problem complexes: variation, divergence, isolation, and selection. Some calls for ‹synthesis’ focused on these problem complexes (sometimes on one of these; other times, all). In these calls, comprehensive and pluralist compendia of plausibly relevant elements were preferred over reaching consensus about the value of particular formulae. Third, increasing confidence in the study of common problems coincided with methodological and epistemic changes associated with experimental taxonomy. Finally, the surge of interest in species problems and speciation in the 1930s is intimately tied to larger trends, especially a shifting balance in the life sciences towards process-based biologies and away from object-based naturalist disciplines. Advocates of synthesis in evolution supported, and were adapting to, these larger trends. Cain, Joe. 2009. Ritual Patricide: Why Stephen Jay Gould Assassinated George Gaylord Simpson. In David Sepkoski and Michael Ruse (eds.). The Paleobiological Revolution: Essays on the Growth of Modern Paleontology (Chicago: University of Chicago Press), pp. 346-363. Order UK or US. Abstract: Simpson was the undisputed American heavy-weight in macro-evolutionary theory prior to paleobiology’s disciplinary formation in the 1970s. Simpson’s intellectual influence on this next generation of thinkers is tied intimately to aggressive and bitter disputes regarding continuity versus originality. In the process, Simpson’s macro-evolutionary views were attacked in volleys of empirical and theoretical criticism. They also were attacked on historical and philosophical grounds, as workers struggled to distinguish new from old. These attacks took on an intensity well beyond the norm for contentiousness theoretical disputes. These events are best understood as ritual patricide. The fight with Simpson functioned as a unifying force in the frantic discipline building underway in macro-evolutionary studies during the 1970s. Cain, Joe. 2009. Ernst Mayr and the ‘Biology of Birds’, in Cain, J. and Ruse, M. (eds.). 2009. 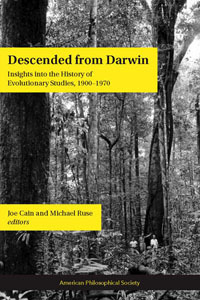 Descended from Darwin: Insights into the History of Evolutionary Studies, 1900-1970 (Philadelphia: PA: American Philosophical Society. Transactions of the American Philosophical Society, volume 99, part 1). Volume is open access. Cain, Joe. 2009. [11 articles]. In Evolution: The First Four Billion Years, edited by Michael Ruse and Joseph Travis. (Cambridge: Harvard University Press). ISBN 978-0-674-03175-3. Cain, J. (ed) 2007. Sewall Wright Taught Me (London: Euston Grove Press), 3 volumes. Cain, J. (ed) 2007. Regular Contact With Anyone Interested. Documents of the Society for the Study of Speciation. 2nd edition (London: Euston Grove Press), 103p. Cain, Joe. 2004. Missing items from published bibliographies of George Gaylord Simpson. Archives of Natural History 31: 353-355. Cain, Joe. 2004. Launching the Society of Systematic Zoology in 1947. In D. Williams and P. Forey. Milestones in Systematics (London: CRC Press), pp. 19-48. 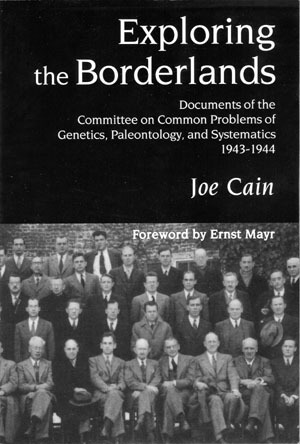 Joe Cain (ed) 2004 Exploring the Borderlands: Documents of the Committee on Common Problems of Genetics, Paleontology, and Systematics, 1943-1944. ISBN: 0-87169-942-7. This committee is key to American organising effects associated with the evolutionary synthesis and Ernst Mayr’s involvement in it. Cain, Joe, ed. 2004. Exploring the borderlands: documents of the Committee on Common Problems of Genetics, Paleontology, and Systematics, 1943-1944. Transactions of the American Philosophical Society. 94: xlii + 160. Cain, Joe. 2003. A matter of perspective: disparate voices in the evolutionary synthesis. Archives of natural history 30: 28-39. Abstract: The paper examines book reviews produced for George Gaylord Simpson’s (1944) Tempo and mode in evolution. This book was one of a series of key American publications in the synthesis period (1930s–1940s) of evolutionary studies. When these reviews are organised by their authors’ specialities, patterns in emphasis arise. The patterns raise important questions about reader perspective and the various ways meaning was imposed onto this book. The analytical concept of polyvalence – the idea that within a community of readers, texts come to have multiple meanings and this pluralism leads to different notions of value – provides a useful tool for drawing implications about this case. In particular, an emphasis on polyvalence and multiple perspectives solves a stalemate between conflicting interpretations of the synthesis period. The reviews of Simpson’s book show many perspectives were active in the period, yet the main historical interpretations of the period each build from only one of those multiple perspectives. As a result, each necessarily is incomplete. A more satisfactory understanding of the period will need to build on the concept of polyvalence. Cain, Joe. 2002. Co-opting colleagues: appropriating Dobzhansky’s 1936 lectures at Columbia. Journal of the history of biology 35: 207-219. Abstract: This paper clarifies the chronology surroundingthe population geneticist Theodosius Dobzhansky’s 1937 book, Genetics and the Origin of Species. Most historians assume (a) Dobzhansky’s book began as a series of “Jesup lectures,” sponsored by the Department of Zoology at Columbia University in 1936, and (b) before these lectures were given, Dobzhansky knew he would produce a volume for the Columbia Biological Series (CBS). Archival evidence forces a rejection of both assumptions. Dobzhansky’s 1936 Columbia lectures were not Jesup lectures. The book he intended to write from his lectures began as a stand-alone text in evolutionary genetics; the CBS had been defunct since 1910. In May 1937 – seven months after Dobzhansky’s Columbia lectures – Leslie Dunn lobbied Columbia University torevive the CBS and the Jesup lecture series. He then quietly back dated, naming Dobzhansky a Jesup lecturer and co-opting his book manuscript as the first volume in the revived CBS. A detailed chronology of this 1936–1937 period is provided. This relocates the CBS and Jesup revivals within the narrow context ofzoology at Columbia University. These helped Dunn and colleagues define cutting edges anddefine themselves as managers and promoters of those edges. Cain, Joe. 2002. Epistemic and community transition in American evolutionary studies: the ‘Committee on Common Problems of Genetics, Paleontology, and Systematics’ (1942-1949). Studies in History and Philosophy of Biological and Biomedical Sciences. 33: 283-313. Abstract: The Committee on Common Problems of Genetics, Paleontology, and Systematics (United States National Research Council) marks part of a critical transition in American evolutionary studies. Launched in 1942 to facilitate cross-training between genetics and paleontology, the Committee was also designed to amplify paleontologist voices in modern studies of evolutionary processes. During coincidental absences of founders George Gaylord Simpson and Theodosius Dobzhansky, an opportunistic Ernst Mayr moved into the project’s leadership. Mayr used the opportunity for programmatic reforms he had been pursuing elsewhere for more than a decade. These are evident in the Bulletins he distributed under Committee auspices. In his brief tenure as Committee leader, Mayr gained his first substantial foothold within the coalescing community infrastructure of evolutionary studies. Carrying this momentum forward led Mayr directly into the project to launch the journal Evolution. The sociology of interdisciplinary activity provides useful tools for understanding the Committee’s value in the broad sweep of change in evolutionary studies during the synthesis period. Logos for the Columbia Biological Series. Columbia University Press. (A) Original CBS logo, appearing on Osborn (1894) and Dean (1895), then reused for Dobzhansky (1937), Northrop (1939) and the first printing of Dobzhansky (1941 second edition); (B) Modified CBS logo on cover of Wilson (1896) and Osborn (1905 second edition). (C) Modified CBS logo appearing on volumes 6-10 and Wilson (1900 second edition); (D) Modified CBS logo appearing-following complaints about an error in the chromosome pattern during mitosis in original logo-on spines of Mayr (1942), Simpson (1944), second and third printings (both in 1947) of Dobzhansky (1941 second edition), and early printings of Stebbins (1950); (E) Modified CBS logo appearing only on Cohen (1968). No logos appear on CBS volumes 4 (third edition). 5, 14, 17-23, and 25. From Joe Cain. 2001. The Columbia Biological Series, 1894-1974: a bibliographic note. Archives of Natural History 28: 353-366. https://www.euppublishing.com/doi/pdfplus/10.3366/anh.2001.28.3.353. Cain, Joe. 2001. The Columbia Biological Series, 1894-1974: a bibliographic note. Archives of Natural History 28: 353-366. Abstract: The Columbia Biological Series (1894–1974) was produced by the Department of Biology (later Zoology) of Columbia University, New York, and spanned a wide range of topics within the biological sciences. This paper provides a bibliography for the twenty-five volumes of this series together with basic details on the launch (1894), re-launch (1937), and history of the series. The series receives attention from historians of biology principally as the source for canonical texts in the synthesis period of evolutionary studies, with publications by Dobzhansky, Mayr, Simpson, and Stebbins. This note provides additional details on the publication history of these volumes. Synthesis historians, myself included, have poorly appreciated how the production of this series fit into efforts to promote Columbia University as a major centre for innovative biological research. We also have poorly understood the relations between these books and the Jesup lecture series, an irregular event sponsored by the department at Columbia. Tracing the series’ publication history speaks to both these topics. Cain, Joe. 2000. For the ‘promotion’ and ‘integration’ of various fields: first years of Evolution, 1947-1949. Archives of Natural History 27: 231-259. Abstract: Under the auspices of the Society for the Study of Evolution, Ernst Mayr launched Evolution late in 1946. For three years he used this journal as a means for implementing reform in evolutionary studies and evolutionary taxonomy. These reforms included: establishing a community of discourse on evolutionary “factors”, “forces”, and “mechanisms”, introducing “balance” in that discourse (which entailed working to offset an impression of intellectual imperialism by Drosophila and evolutionary genetics), and working to convince fellow “museum men” that evolutionary systematics and the study of evolutionary mechanisms offered the penultimate goal for taxonomy. Tirelessly recruiting, Mayr encountered considerable difficulty on each front during his tenure. By the time he stepped down, it was by no means clear that the ideal of synthesis and co-operation had been achieved. Analysis of Mayr’s efforts reveals the group of synthesis actors more as a loose coalition of co-incident interests than a fully reconciled, evenly balanced community. Cain, Joseph. 2000. Towards a ‘greater degree of integration’: The Society for the Study of Speciation, 1939-1941. British Journal for the History of Science 33: 85-108. Abstract: Intellectual and professional reforms in evolutionary studies between 1935 and 1950 included substantial expansion, diversification, and realignment of community infrastructure. Theodosius Dobzhansky, Julian Huxley and Alfred Emerson organized the Society for the Study of Speciation at the 1939 AAAS Columbus meeting as one response (among many coming into place) to concerns about ‘isolation’ and ‘lack of contact’ among speciation workers worried about ‘dispersed’ and ‘scattered’ resources in this newly robust ‘borderline’ domain. Simply constructed, the SSS sought neither the radical reorganization of specialities nor the creation of some new discipline. Instead, it was designed to facilitate: to simplify exchange of information and to provide a minimally invasive avenue for connecting disparate researchers. Emerson served as SSS secretary and was its principal agent. After publishing one block of publications, however, the SSS became ‘quiescent’. Anxious to promote his own agenda, Ernst Mayr tried to manoeuvre around Emerson in an effort to revitalize the project. After meeting impediments, he moved his efforts elsewhere. The SSS was too short-lived to merit a claim for major impact within the community; however, it reveals important features of community activity during the synthesis period and stands in contrast to later efforts by George Simpson, Dobzhansky, and Mayr. Cain, Joe. 2000. Woodger, Positivism, and the Evolutionary Synthesis. Biology and Philosophy 15: 535-551. Abstract: In Unifying Biology, Smocovitis offers a series of claims regarding the relationship between key actors in the synthesis period of evolutionary studies and “positivism,” especially claims entailing Joseph Henry Woodger and the Unity of Science Movement. This commentary examines Woodger’s possible relevance to key synthesis actors and challenges Smocovitis’ arguments for the explanatory relevance of logical positivism, and positivism more generally, to synthesis history. Under scrutiny, these arguments are short on evidence and subject to substantial conceptual confusion. Though plausible, Smocovitis’ minimal interpretation – that some generalised form of Comtean positivism had a role in synthesis history – requires more of an evidential basis and must engage existing scholarship on epistemic reforms in the biological sciences prior to the synthesis period. Smocovitis is right to investigate epistemology in the synthesis period of evolutionary studies and to look for links to wider changes in science and philosophy. However, in its present form, Unifying Biology fails to support her basic interpretation. Cain, Joseph. 1994. Ernst Mayr as community architect: launching the Society for the Study of Evolution and the journal Evolution. Biology and Philosophy 9: 387-427. Abstract: Ernst Mayr’s contributions to 20th century biology extend far beyond his defense of certain elements in evolutionary theory. At the center of mid-century efforts in American evolutionary studies to build large research communities, Mayr spearheaded campaigns to create a Society for the Study of Evolution and a dedicated journal, Evolution, in 1946. Begun to offset the prominence of Drosophila biology and evolutionary genetics, these campaigns changed course repeatedly, as impediments appeared, tactics shifted, and compromises built a growing coalition of support. Preserved, however, were designs to “balance” the community and journal with careful equation of status and explicit partitioning of responsibilities within the working coalition. Choice terms such as “cooperation” and “unity” carried a strong political message. Mayr’s editorship of Evolution provides a superb example of these “balancing” efforts. The mid-century infrastructural activities described herein also represented aggressive attempts to leverage control across several layers of community. Leaders of these campaigns sought: (1) to promote evolutionary studies as a modernized research discipline and place it at the center of American biology, (2) to promote evolutionary studies within existing disciplines — e.g. systematics, genetics, and paleontology, (3) to foster certain research styles within evolutionary studies, and (4) to emphasize certain solutions to prominent research questions. Throughout, Mayr interjected his priorities, tactics and energy. Cain, Joe. 1993. Common problems and cooperative solutions: organizational activities in evolutionary studies, 1936-1947. Isis 84 (1): 1-25. Cain, Joe. 1992. Building a temporal biology: Simpson’s program for paleontology during an American expansion of biology. Earth Sciences History 11: 30-36. Abstract: A central, though overlooked, dimension of George Simpson’s (1944) book, Tempo and Mode in Evolution, involved its emphasis on cooperative and historical approaches to evolutionary studies. Together, these two orientations formed Simpson’s program in temporal biology, and during the late 1930’s and early 1940’s, Simpson not only pursued this program, he loudly advocated and actively promoted it. Vertebrate paleontology had lost considerable prestige in evolutionary studies during this period (both at Simpson’s home institution and within biology generally), and Simpson fought to empower and enfranchise his discipline. Tempo and Mode was part of that effort, which took place in the broader context of the evolutionary synthesis. Cain, Joe. 1990. George Gaylord Simpson’s ‘History of the Section of Vertebrate Paleontology in the Paleontological Society’. Journal of Vertebrate Paleontology 10: 40-48. Abstract: In December 1940, vertebrate paleontologists dissolved the Paleontological Society’s Section of Vertebrate Paleontology and formed the Society of Vertebrate Paleontology as the principal professional organization of their discipline. During the months leading to this founding meeting, Simpson wrote a manuscript about the former Section. That manuscript, which Simpson never published, had two purposes: (1) to justify the dissolution of the Section and the formation of the separate Society, and (2) to describe the Section’s administrative practices. Presented here in its entirety, with historical notes added by Cain, this manuscript provides insight into the relation between vertebrate paleontologists and the Paleontological Society during the 1930s. Simpson’s manuscript also illustrates the extent to which vertebrate paleontologists expressed disciplinary independence during this period. Cain, Joe. 1989. Moving Beyond Consistency: The Historical Significance of Simpson’s Tempo and Mode in Evolution (81Mb). Unpublished MA thesis. University of Maryland College Park. Abstract: Simpson’s (1944) Tempo and Mode in Evolution (TM) is a complex book. TM’s content and significance have been poorly examined previously. My integrated analysis emphasizes two themes. First, Simpson elaborated a comprehensive evolutionary theory. Second, Simpson pursued different agendas with different audiences. TM defended a particular synthetic theory against alternatives. Also, TM supported a particular inter­school conceptual unification: Morgan’s chromosome theory of heredity, Wrightian population genetics, adaptation via natural selection, and Simpson’s temporal approach to evolution. TM was well received among paleontologists, who largely adopted Simpson’s conclusions as the foundation for their research; however, biologists mostly favored extrapolationist alternatives instead of Simpson’s agenda, citing TM only to validate particular explanatory tools. …..I untangled three conflated uses of the “consistency” argument for TM: literal consistency, extrapolation, and a shared explanatory tool box. The latter most precisely describes (1) the relation between Simpson and other MS synthetic theorists, and (2) the relation between Simpson’s explanations for micro-, macro-, and mega-evolution. This topic provides only one (and not the most significant) point regarding TM. Simpson’s other agendas were separable from the construction of his comprehensive theory, as TM was far more than a “consistency” argument. …..A research school-level of analysis provides a finer-grained study of synthetic theories. This recognizes Simpson’s intellectual achievements plus the dissent within individual fields. Also, it allows for a study of the competition between conflicting synthetic theories. Furthermore, the study of explanatory tool boxes provides an alternative method for studying evolutionary theorists. Cain, Joe. 2014. “Darwin in London.” The Linnean: Newsletter and Proceedings of the Linnean Society of London 30 (2):13-21. Cain, Joe. 2013. 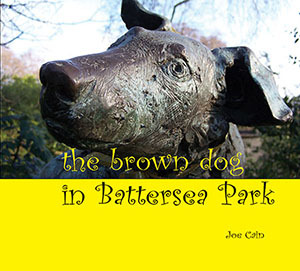 The Brown Dog in Battersea Park (London: Euston Grove Press), 32p. ISBN 978-1-906267-31-5. Cain, Joe. 2011. 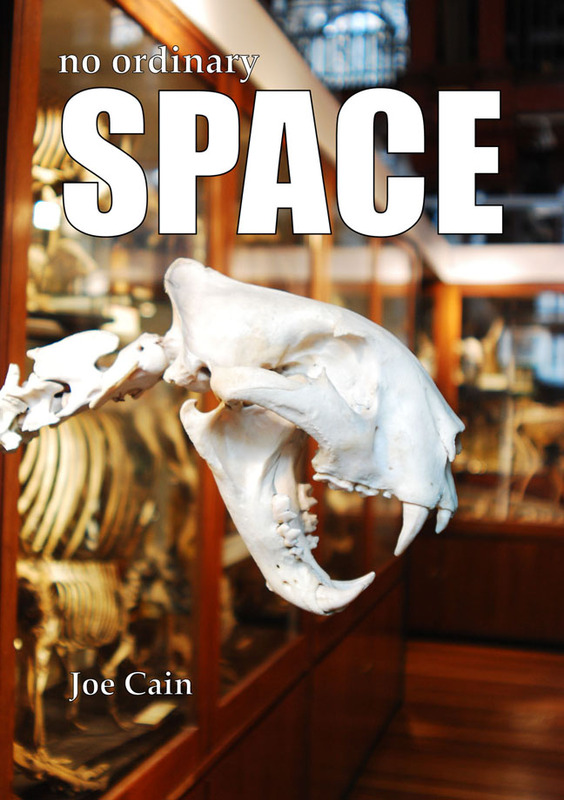 No Ordinary Space: A Brief History of the Grant Museum’s new home at University College London. (London: UCL Department of Science and Technology Studies). STS Occasional Papers number 1. Cain, Joe and Messenger, Sharon (eds.). 2009. Charles Darwin’s The Expression of the Emotions in Man and Animals (London: Penguin Classics). Includes Introduction and scholarly materials by Cain. Order UK or US. Cain, Joe. (ed.). 2009. William Jennings Bryan’s Last Message: a reprint of his famous closing arguments for the 1925 Scopes Monkey Trial, undelivered and posthumously published (London, Euston Grove Press). Edited, with an introduction, by Joe Cain. Cain, Joe. 2007. Rethinking Attacks on Evolution. Lessons from the 1925 Scopes Trial. In Michael Ruse (ed.). 2007. Philosophy of Biology 2nd Revised edition. Buffalo, NY: Prometheus Books, pp. 439-456. Order UK and US. Cain, Joe. 2005. Joseph Henry Woodger (1894-1981) Papers at University College London. Mendel Newsletter. 14: 7-8. Cain, Joe. 2003. Publication history for Evolution: a journal of nature. Archives of natural history 30: 168-171, 298.
original article | correction | Website for facsimiles of EJN. Cain, Joe. 2001. Scopes Trial and Fundamentalism in the United States. In Encyclopedia of Life Sciences produced by Macmillan Publishers Ltd, Nature Publishing Group. <http://www.els.net/>. Cain, Joe. 2000. David Lack and the development of field ornithology. In Encyclopedia of Life Sciences produced by Macmillan Publishers Ltd, Nature Publishing Group. <http://www.els.net/>. Darden, Lindley, and Joseph Cain. 1989. Selection type theories. Philosophy of Science 56: 106-129. Reprinted in 2006. Reasoning in Biological Discoveries: Essays on Mechanisms, Interfield Relations, and Anomaly Resolution, edited by L. Darden. Cambridge: Cambridge University Press, pp. 182-206. Abstract: Selection type theories solve adaptation problems. Natural selection, clonal selection for antibody production, and selective theories of higher brain function are examples. An abstract characterization of typical selection processes is generated by analyzing and extending previous work on the nature of natural selection. Once constructed, this abstraction provides a useful tool for analyzing the nature of other selection theories and may be of use in new instances of theory construction. This suggests the potential fruitfulness of research to find other theory types and construct their abstractions. Read it with: Cain, Joseph, and Lindley Darden. 1988. Hull and selection. Biology and Philosophy 3:165-171. More on critical factors and a focus on the environment. Joe Cain. 2013. The Brown Dog in Battersea Park (London: Euston Grove Press), 32p. ISBN 9781906267359. Cain, Joe. 2004. Why be my colleague’s keeper? Constructing moral justifications for peer review. In Peer Review: A Critical Inquiry, edited by D. Shatz. Lanham: Rowman and Littlefield, pp. 179-190. This is a reprint of: Cain, Joe. 1999. Why be my colleague’s keeper? Constructing moral justifications for peer review. Science and Engineering Ethics 5 531-540. Abstract: Justifying ethical practices is no easy task. This paper considers moral justifications for peer review so as to persuade even the sceptical individualist. Two avenues provide a foundation for that justification: self-interest (the right behaviour is that which maximally serves one’s own interests) and social contract theory (the right behaviour is that which best meets obligations set in binding social contracts). A wider notion of “interest” permits the self-interest approach to justify not only submitting one’s own work to peer review but also removing oneself momentarily from the production of primary knowledge to serve as a rigorous, independent, and honest referee. The contract approach offers a non-selfish alternative and relies on four types of binding social contracts: those implicit in accepting funds, those implicit in asserted professional status, those to contribute what is of most value to society, and those to defend the ideals of the Academy. Efforts to restore respect for rigorous, independent, honest peer review should begin in earnest. Cain, Joe. 1997. With bones in contention: repatriation of human remains. In B. Schrag. 1997. Research ethics: fifteen case studies and commentaries, volume 1. Bloomington, IN: Association for Practical and Professional Ethics. pp. 138-148. Cain, Joe. 2010. Practical concerns when implementing object-based teaching in higher education. University Museums and Collections Journal 3: 197-203. Abstract: The first rule of business is “know your customer”. This essay focuses on the user’s perspective: what do tutors need to make OBL an attractive proposition? It dissects three customer needs: the need for engagement, logistical concerns, and pedagogical dimensions. Several suggestions are offered regarding each type of need. The overall goal is to encourage the structuring of OBL promotions and provision in ways that integrate easily into the working life of tutors. This is the key to successful programme development. Cain, Joe. 2009. Life History of Your PhD Thesis. ViewPoint. Newsletter of the British Society for the History of Science 89 (June): 1-3. Cain, Joe. 2005. Teaching through objects: a user’s perspective. NATSCA News 7 (Dec 2005): 2-7. Cain, Joe. 2003. Diversifying assessment 3: Web projects in undergraduate history of science. Discourse: Learning and Teaching in Philosophical and Religious Studies 3 (1): 27-40. Also reprinted in The Challenges of using the World-wide Web in Teaching History of Science, edited by D. J. Mossley. Leeds: Philosophy and Religious Studies Subject Centre, Learning and Teaching Support Network. Cain, Joe. 2003. Diversifying assessment 2: posters and oral presentations in undergraduate history of science. PRS-LTSN Journal 2 (2): 50-72. Jarvis, Louise, and Joe Cain. 2002. Diversifying assessment 1: essays and examinations in undergraduate history of science. PRS-LTSN Journal 2 (1): 24-57. Cain, Joe. 1999. Have I wasted my summer on this Web site? (AHA) Perspectives 37 (2): 25-30. Cain, Joe. 1988. Creationism and mammal origins. Journal of Geological Education 36: 94-105.